For 12 years, till 2007, the torrent of high school film moved from city to city around Croatia. Then, in a Karlovac twist – the “froggers” moved into their natural habitat – the fifth river – the river of film, which was colored in yellow under the name the Youth Film Festival and as such remains in Karlovac indefinitely. The water climate of Karlovac is obviously fertile ground for film and the film festival in its teens, grown jointly by the Cinema Club Karlovac and the Croatian Film Association, while a special incentive for growth is given by the 4 thousand visitors each year (during the 4 days of the film harvest) and hundreds of young authors whose films have swept over Karlovac. Encouraged by a great catch in the first year, the “froggers” ventured into international territory creating the Four River Film Festival so, since 2008, there is international high school film running through our waters. 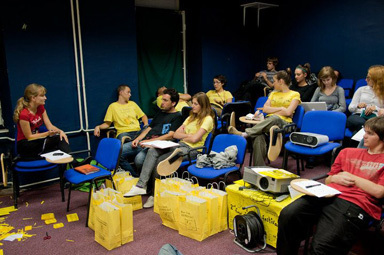 Fifth year in a row, Karlovac soil is enriched by film waters and it’s becoming more fertile and yellow every time, and it’s quite obvious that the color yellow is becoming the official color of the festival and Karlovac the official incubator of high school film!